Defense Secretary Jim Mattis ordered a change in the management of NC3 out of concern that it did not have a cohesive governance structure. WASHINGTON — After a months-long review, the Pentagon has decided that U.S. Strategic Command should be solely in charge of the classified communications system that keeps the president connected to military forces during a nuclear event. The review was prompted by concerns that the nation’s nuclear command, control and communications systems, or NC3, was not under a single chain of command. Officials also have warned that the technology is outdated and that there is no clear plan to modernize it. “The Chairman of the Joint Chiefs of Staff has appointed the commander of U.S. Strategic Command to be the NC3 enterprise lead, with increased responsibilities for operations, requirements, and systems engineering and integration,” U.S. STRATCOM spokeswoman Maj. Meghan Liemburg-Archer said on Monday in an email to SpaceNews. The office of the undersecretary of defense for acquisition and sustainment will handle resources and acquisition for NC3. Defense Secretary Jim Mattis ordered the review out of concern that NC3 did not have a cohesive governance structure. 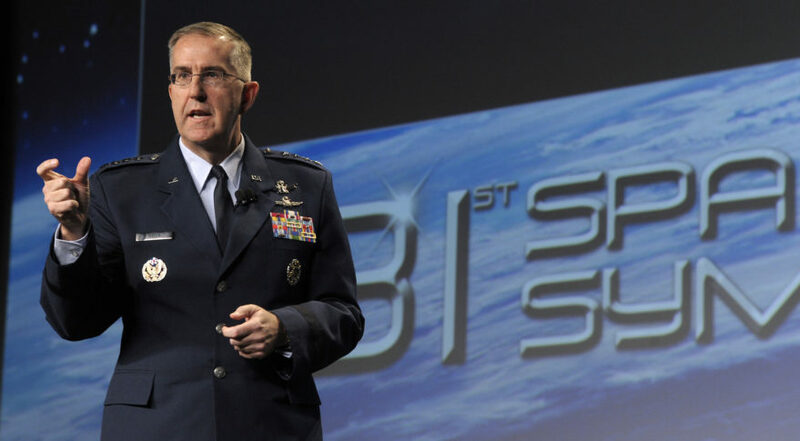 The commander of U.S. Strategic Command Gen. John Hyten told SpaceNews in March that he was spending a lot of time dealing with the future of NC3. CNN reported on Friday that Hyten revealed during a recent speech at the naval base in Kings Bay, Georgia, that he would be taking charge of NC3 operations and systems. Hyten said in that speech that Mattis wanted a single officer responsible for NC3, as opposed to the “committee-like” structure that has existed so far. Air Force Global Strike Command manages the Air Force’s portion of NC3. The Air Force is responsible for about 70 percent of the 62 air, space and ground systems that make up the NC3 and collectively provide secure, survivable and resilient communications for the president to issue nuclear orders. The NC3 includes warning satellites and radars; communications satellites, aircraft, and ground stations; fixed and mobile command posts; and the control centers for nuclear systems. The NPR said many of these systems use technology that has not been modernized in almost three decades. Ensuring the security of satellites that support classified nuclear communications and missile warning is a major concern because they are also used by the military in day-to-day operations. Some are specific to the nuclear mission, but most support both nuclear and conventional missions. When nuclear weapons systems now in development become operational — like the the B-21 bomber, a new long-range cruise missile, a new ICBM and the Columbia-class submarines — they will have modern technology and eill have to plug into the NC3 architecture. This will require a major update of NC3.